I have been in the mood to make some jam or jelly lately. But what kind to make?? Usually, I would let the sales at the grocery store determine this. And in this case, that was part of my decision. The other part was the figs I had bought earlier this year at Trader Joe's- just sitting in the freezer, begging to be used. City Market had strawberries on sale this weekend. Hmmmm....strawberries and figs....that sounds like jam to me! 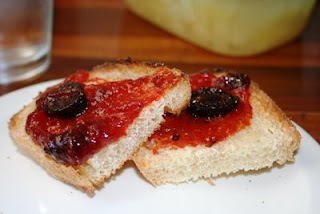 In my usual pattern, I googled strawberry fig jam to see what might pop up. I found a recipe, complete with step by step pics- so I figured I'd use that. I think the person who made the recipe probably makes this jam all the time, and just expected the reader to know instinctively what to do, because there were several details left out. I started by washing, hulling and quartering my strawberries. I needed 3 cups. Then I washed, destemmed and sliced my figs (I used a combo of Calmyrna and Mission figs). I needed 3 cups of them, too. I dumped them in a pot with a mixture of 1/4 c. of white sugar and a whole pack of pectin (the amount needed was one of the details left out of the original recipe- so I winged it). I waited until it heated up and began to bubble. The recipe said it should boil, but there wasn't enough liquid to do that. So- I added a little water. After it boiled vigorously for about a minute, I dumped in the rest of the sugar (2 cups). Next time I'll use a little less. I let the mixture boil about five minutes (no time measurements were given in the recipe), then took it off the heat. I filled my jars and processed them in a water bath for about 25 minutes (10 minutes is recommended for sea level, plus an additional 10- 15 minutes for our altitude). It tastes really good, but I think next time I'll do two things....I'll use less sugar and I'll cook it longer. To me, it has an ever so slightly grainy texture. But it fit the bill for the jam I was craving, and it has put me in the mood to make even more! My next attempt will be mango vanilla!! 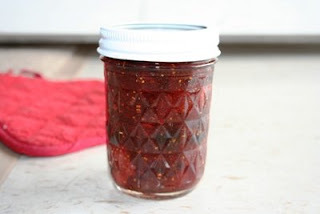 how many jars of this size did you get with 3 cups fig and 3 cups strawberries?